My “new” sewing machine, purchased on eBay, arrived today. I have named her Sylvia. 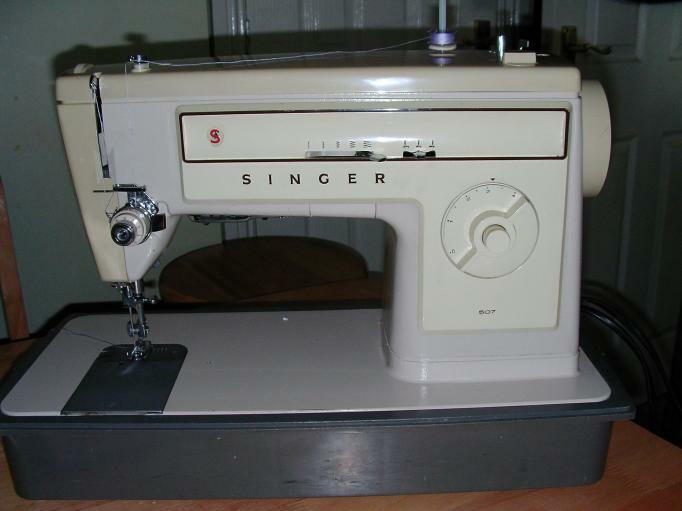 She is a Singer 507, and she was made in 1975. She is very similar to the sewing machine I had in America before I moved to England. Sylvia came with a nicely-done instruction manual, which someone scanned from an original and printed on a colour printer, then spiral-bound. 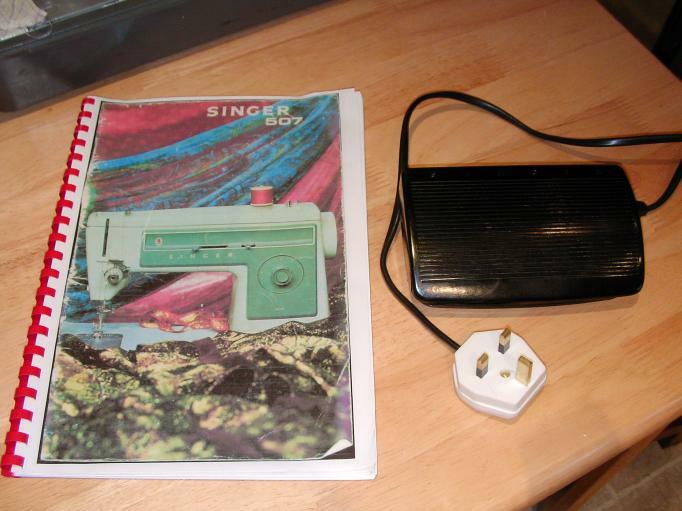 She also has a genuine Singer foot pedal and a new re-wired electric plug. My little daughter and I sewed on her all afternoon, and she works great. 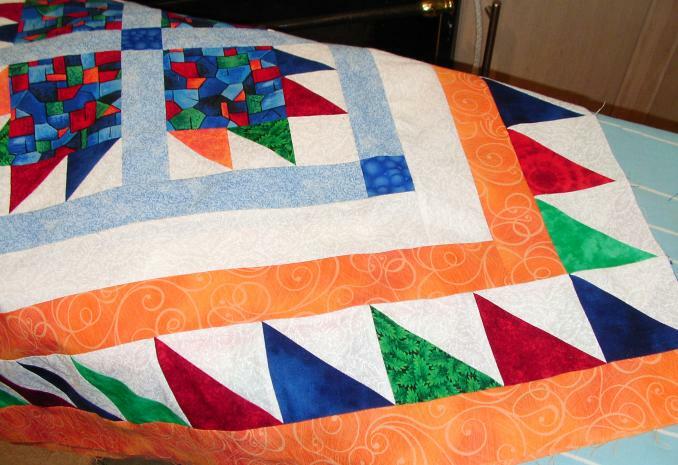 I’ve joined another quilt-along, this time with Amandajean at Crazy Mom Quilts. This one is to make a colourful 9-patch top. Photos of the model with crisp white sashing are on her blog. We are supposed to make one block a day and finish it up by summertime. 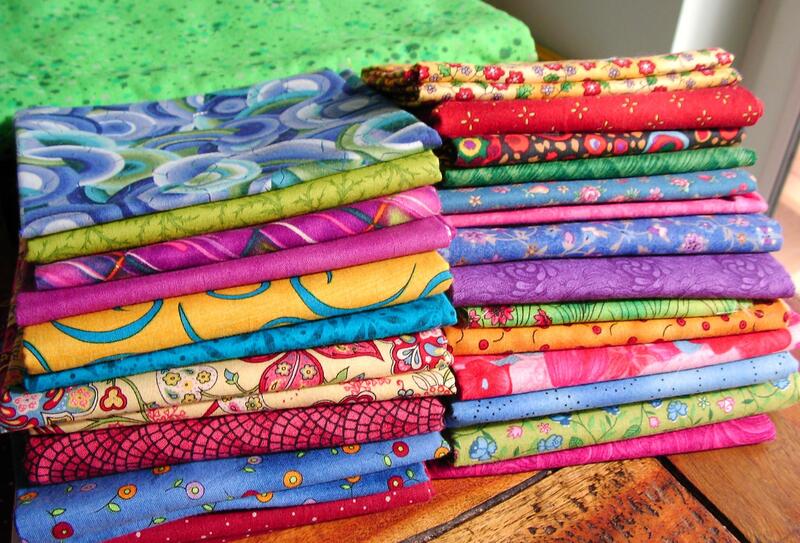 I haven’t started yet, but I have chosen some fabrics from stash that I would like to use up. Instead of white sashing, mine is going to have bright green sashing. I am also working on the Ice Cream Social at Hugs, Melinda‘s blog and made this little drawing of my mini-quilt-to-be. I don’t have fancy quilting software, so this is actually a colouring book-type page with Friendship Stars that have been coloured in to look like ice cream cones. My colour is chocolate, and I can use two other colours as well. 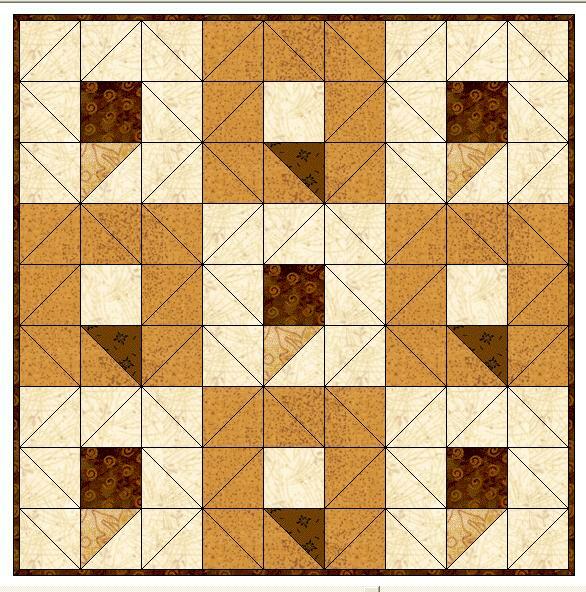 My blocks are going to be set on a twist, using Mary Johnson‘s instructions for Twisted Happy Blocks, and my little quilt will be 22.5 inches square when finished. 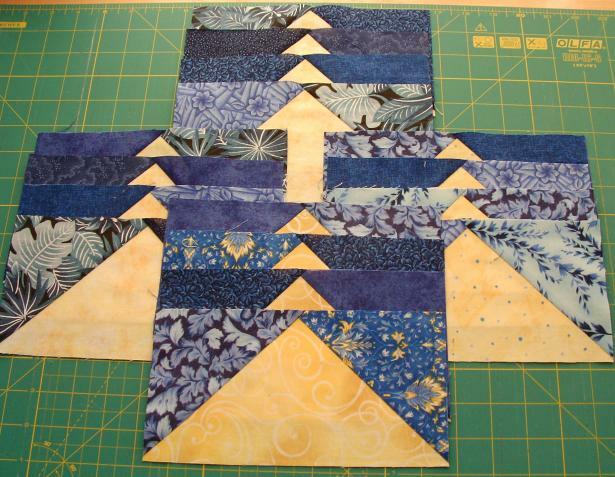 And, I am continuing with my blue-and-yellow interpretation of Judy Laquidara’s latest Stash Quilt Project. Step 3 of the instructions was posted yesterday, and the previous steps are also available on Judy’s blog. The fabrics for my Bears in the Art Museum quilt top are all from stash, but I didn’t have a nice backing, so I just had to buy some fabric this week. My husband helped me choose this fabric. It feels very soft and luxurious, and I think it will look pretty. It’s called “Imprints,” designed for the Balson Hercules Group. I also started working on Judy Laquidara’s new stash project. She is doing her quilt in bright colours, but she said we could use any colours we like. Mine is going to be all blue and yellow. I’ve been dreaming of ways to use my collection of blues and yellows together, and this pattern will be perfect. I have finished 16 Flying Geese blocks already. Judy recommended Patti Anderson’s method for No-Waste Flying Geese, and I think it is brilliant and so easy to do. My Bears in the Farmhouse quilt top, now renamed “Bears in the Art Museum,” is finished! 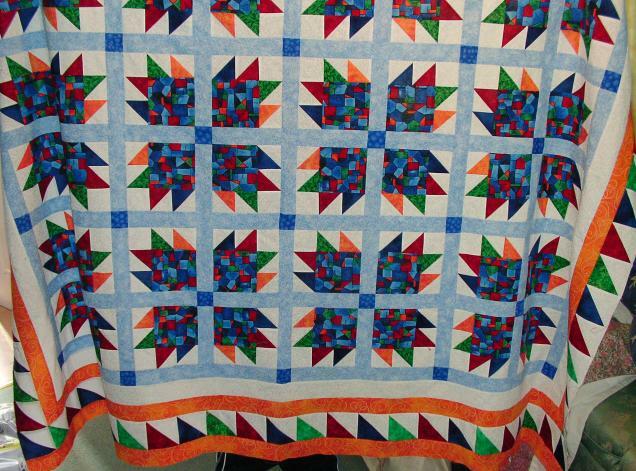 This project was part of Judy Laquidara‘s Quilt Along. Finished quilt tops by other participants can be viewed here. Judy said about 300 participants started the project, and more than 150 carried on through the final step. I’m making progress on my Bears in the Farmhouse quilt from Judy Laquidara’s Quilt Along. The half-square borders are on all the way around, and I have started on the second orange border. I’m obsessed with this quilt. I want to work on it all the hours there are, but you know how families are…..they are always wanting to eat, and to wear clean clothes. 😉 Bless ’em. While I’ve been working on these borders, I’ve been thinking about how I want to quilt this top. I’ve seen a pattern that I like in Charlene C. Frable’s book, Quilt as Desired, and I’ve been practicing. However, my focus fabric is a bit busy, so a plain meandering pattern might be better. We’ll see. I’ll be doing the quilting on my domestic sewing machine, a Janome 6500 P. I’ve also decided to call my quilt, “Bears in the Art Museum,” since my focus fabric is a design inspired by the work of Paul Klee. My Stash Report for Week 14 has only changed by 1/4 yard used, which was binding on a UFO that I finished for the Stashbuster UFO Challenge. 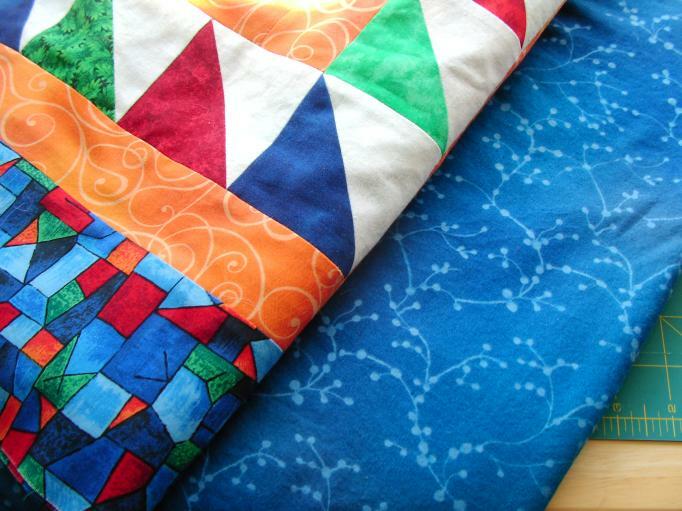 I’m waiting until the Bears in the Farmhouse quilt is finished before I count that fabric. I’ve finished my second UFO for the Stashbuster UFO Challenge for 2009. 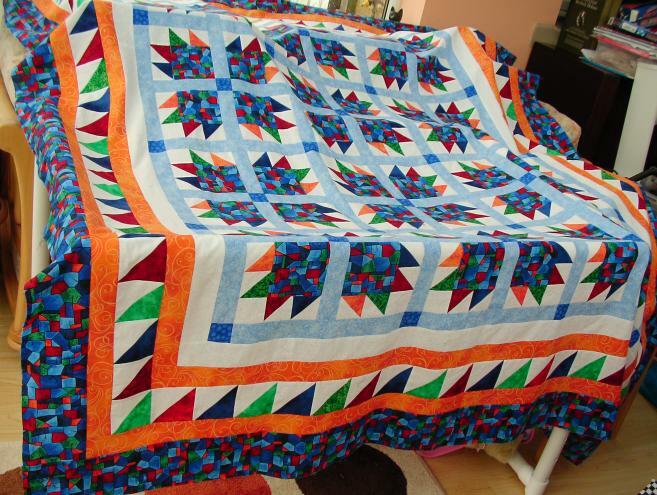 It was originally planned as a wallhanging for our old house, and I started it in 2000 with blocks and scraps left over from the larger quilt featured in my homepage banner. We don’t really have a good wall for it to hang in this house, and my husband and daughter both said they liked it better as a table topper, so…table topper it is! 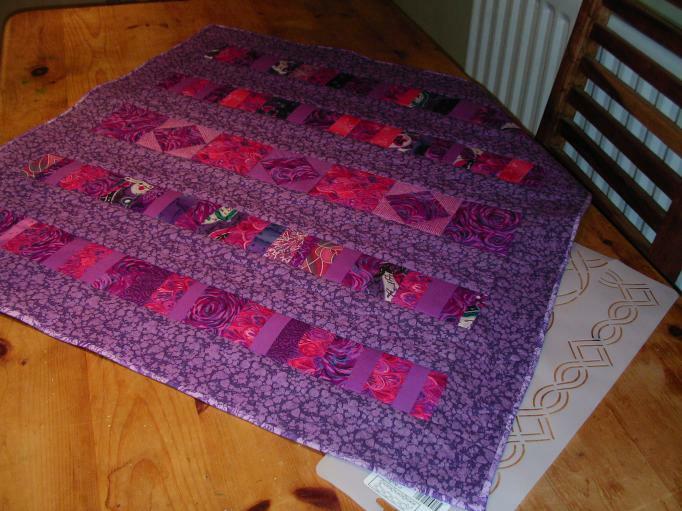 The quilting was done on my domestic sewing machine. I drew the motif on the fabric with a white pencil using the stencil as a guide, and modified it to use only a single line of stitching instead of the double line. I thought the double line of stitching might be too heavy for this small project. 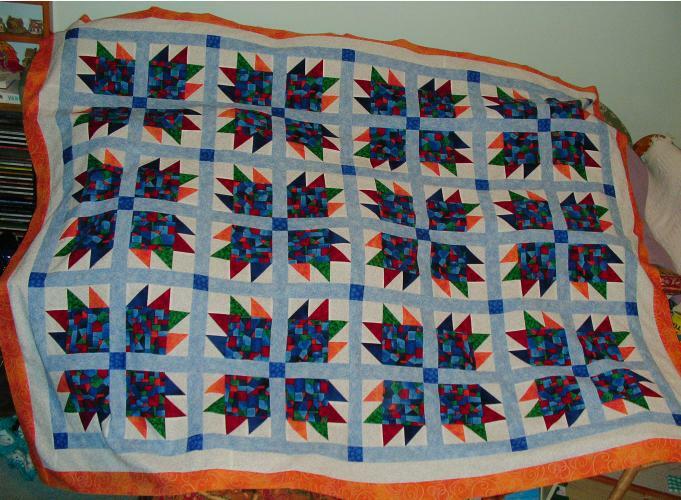 It measures approximately 31 inches square. Now I get to report it on the Stashbuster list as a Finish, just in time for the end of the first quarter of the year!